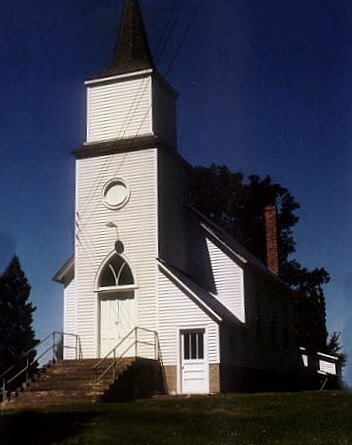 Saint Peter Lutheran Church was originally known as St. Petri Lutheran Church, and was organized in 1888. It was served by Rev. G.P. Nesseth, Rev. Jerdee, Pastor Refsdahl, and Pastor Kringle, among others. Lars Sovick donated the land for the cemetery in 1893. The church was closed in 1966, but is used once a year for a special service and sometimes for funerals. It is well cared for by neighbors who can be very proud of their preservation of Columbia township history. This church is right next to the Clearwater County / Polk County line so there are no doubt people from both counties buried here. Note that the Red River Valley Genealogical Society says this cemetery is in Norman County. See web page for the St. Peter Lutheran Cemetery. Photo of St. Peter Lutheran Church.